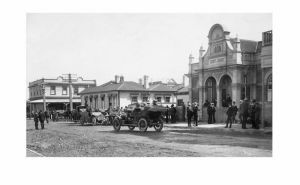 Established in 1919, our history can be traced against the backdrop of the every changing landscape of rural New Zealand. From our country's political and economic policies to innovations in farming and business, we have evolved with the times and continue to build a deep sense of knowledge and belief in our clients and their businesses which is now enherently part of our own DNA. We are as proud of our history as we are of that of our country and communities which is why we have chosen to share it here with you too. 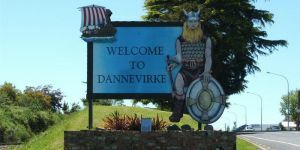 The practice was established in Dannevirke by Archie Runciman (a past mayor of Dannevirke. Cobalt deficiency in soils recognised. Cobalt is added to superphosphate to help make more intensive livestock farming possible. 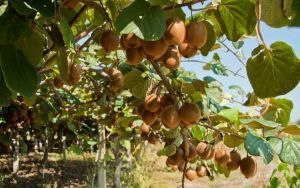 First commercial orchards of Chinese gooseberries (later known as kiwifruit) are established. Archi Runciman was joined by Norman Weebley – Archie Runciman retired in 1930. Income tax was levied on farmers. 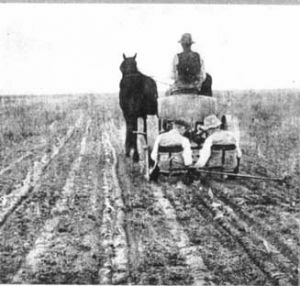 Prior to 1928 no tax levied on farmers because of heavy land tax. General election: First Labour Government elected under Michael Joseph Savage. 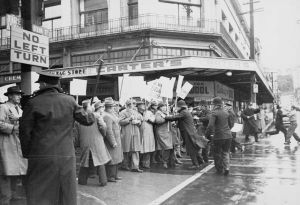 The First Labour Government of New Zealand was the government of New Zealand from 1935 to 1949. 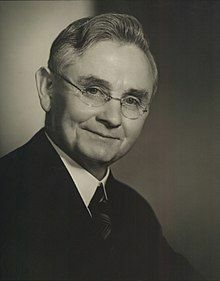 Responsible for the realisation of a wide range of progressive social reforms during its time in office, it set the tone of New Zealand's economic and welfare policies until the 1980s, establishing a welfare state, a system of Keynesian economic management, and high levels of state intervention. Harold Ruby joins the practice. Reserve Bank taken over by state. Guaranteed prices for dairy products introduced. National Party formed from former Coalition MPs. Working week reduced from 44 to 40 hours. April: Federation of Labour unifies trade union movement. 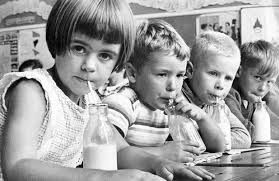 March: Free Milk in schools introduced. Mr H Rowe Dingle joined the practice – he retired in 1950. 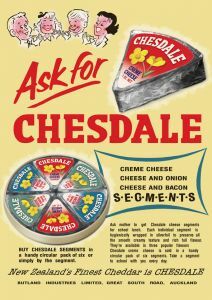 Bulk purchases of farm products by Great Britain. During this decade the number of New Zealand’s farms using milking machines is over 50%. Australia-New Zealand Agreement provides for co-operation in the South Pacific. 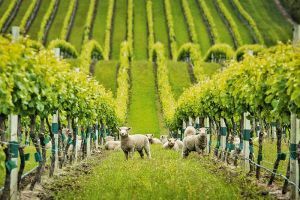 New Zealand scientists produce grasses, clover, crops and breeds of sheep to suit local conditions. Cow population is 1.7 million. Family benefit of £1 per week becomes universal. 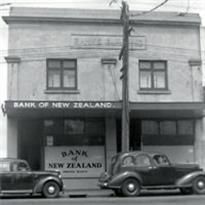 Bank of New Zealand nationalised. Aerial topdressing makes it possible to fertilise hill country paddocks. 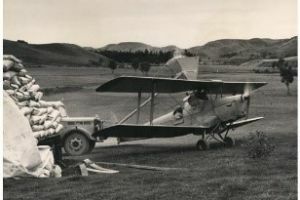 World War II Tiger Moths were among the first aircraft used for topdressing in New Zealand. 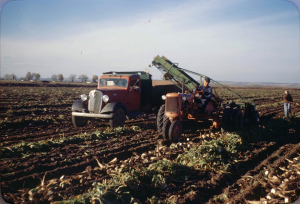 Here, in 1953, a loader bucket releases fertiliser into the aircraft hopper. 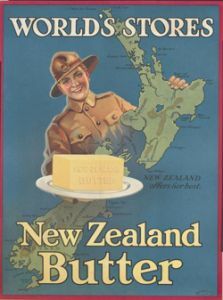 New Zealand gains full independence from Britain. New Zealand Constitution Amendment (Request and Consent) Act 1947 passed, granting Parliament of New Zealand the ability to amend the New Zealand Constitution Act 1852. 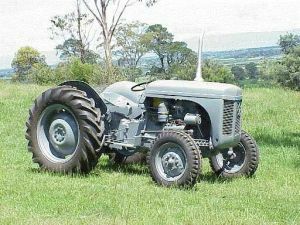 Many aspects of farming are revolutionised with the arrival of the first British-made Ferguson tractor. Frank Skipper joined the practice. Naval and ground forces sent to Korean War. New Zealand Legislative Council abolished. Prolonged waterfront dispute, state of emergency proclaimed. ANZUS treaty signed between United States, Australia and New Zealand. Tanker delivery of whole milk from farms to factory begins. Waikato farmer Ron Sharp develops the herringbone dairy, cutting milking times in half. Herd sizes increase. Dairy products gain 10 years of unrestricted access to Britain. 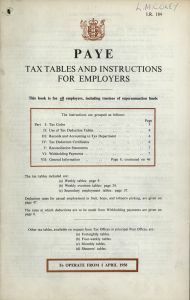 30 November: General election, National loses election, Walter Nash leads Second Labour Government. The 1957 elections marked the beginning of the second Labour government, although this administration was to last only a single term. 26 November: General election, National Government elected. 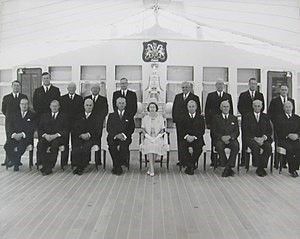 The Second National Government of New Zealand (also known as the Holyoake government) was the government of New Zealand from 1960 to 1972. It was a conservative government which sought mainly to preserve the economic prosperity and general stability of the early 1960s. It was one of New Zealand's longest-serving governments. 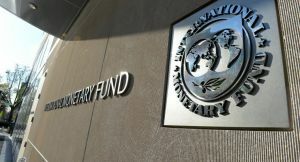 New Zealand joins the International Monetary Fund. Frank Skipper and Norman Webley retired leaving Harold Ruby practising on his own. Water and Soil Conservation Act passed, addressing water and soil pollution issues. Cow population is now over 2 million. 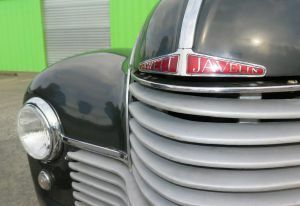 John Clarke joined the practice and worked with Harold Ruby till he retired in 1975 – the practice was known as Ruby & Clarke. 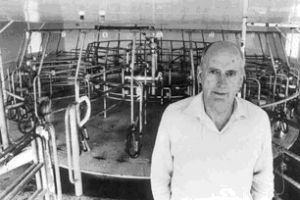 Taranaki farmer Merv Hicks develops the first turnstile milking system – forerunner to the rotary. 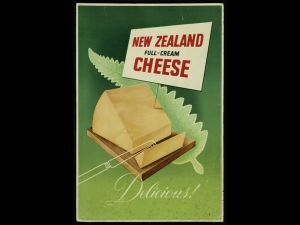 New Zealand secures continued access of butter and cheese to the United Kingdom. 25 November: General election, Labour Government led by Norman Kirk elected. 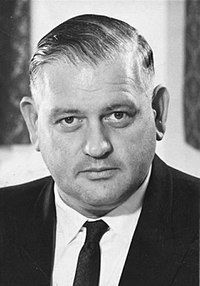 The Labour Party, led by Norman Kirk, defeated the governing National Party which had remained in power for 4 consecutive terms. 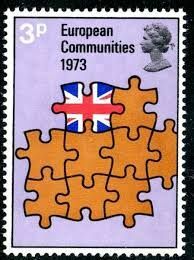 Dairy exports face troubling times as the UK joins the EEC (European Economic Community). Prime Minister Norman Kirk dies. The Waitangi Tribunal is established. 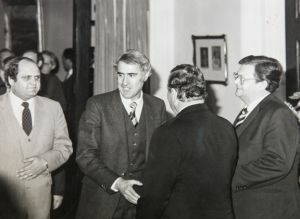 29 November: New Zealand general election, 1975. Robert Muldoon becomes Prime Minister after National Party victory. 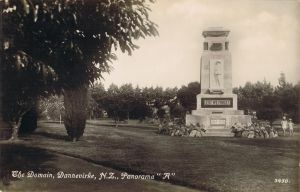 It was the first general election in New Zealand where 18- to 20-year-oldsand all permanent residents of New Zealand were eligible to vote, although only citizens were able to be elected. While National won a majority of seats in parliament, it did not actually win a majority of the vote. 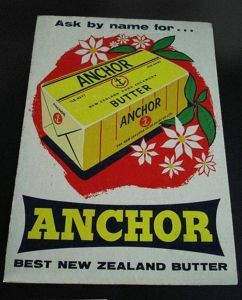 EEC import quotas for New Zealand butter set until 1980. 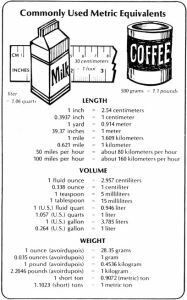 Introduction of metric system of weights and measures. The Livestock Incentive Scheme is set up by the government to encourage farmers to farm more livestock and entice them to stay farming. 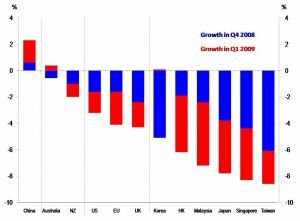 Export competition results in declining international prices. Supplementary Minimum Price scheme (SMPs) is introduced to guarantee farmers a minimum income. The Land Development Encouragement Loans Scheme encourages further development of land into farming pastures. Fertiliser subsidies encourage the use of fertiliser and lime. 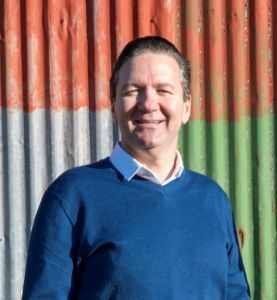 Grant Ingram joined the practice and became a partner in 1992 – the practice was known as Ruby Clarke & Ingram. CER agreement signed with Australia. Year-long wage, price and rent freeze imposed lasts until 1984. Christine and Murray Donald purchased their first “economic” farm at Wimbledon CHB. Government removes subsidies on fertilisers, weed control, tax breaks and grants. Farmers diversify and are more efficient and more responsive to the market. High country sheep farming declines. Number of sheep peaks in 1982 (70 million). Smaller farms amalgamate. 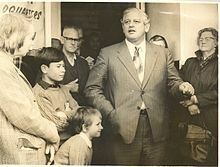 When Prime Minister Robert Muldoon called an election in July 1984 Lange led his party to a landslide victory, becoming, at the age of 41, New Zealand's youngest prime minister of the 20th century. The Fourth Labour Government came to power amid a constitutional crisis. 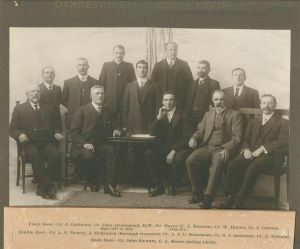 It rapidly implemented far-reaching constitutional, economic and social reforms; however, the free market ethos of Lange's government did not conform to traditional expectations of a social-democratic party. 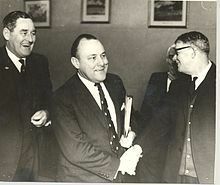 The Reserve Bank advised the Prime Minister, Sir Robert Muldoon, that the dollar should be devalued. 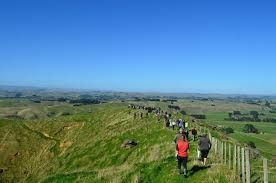 Muldoon ignored the advice, owing to his belief that it would hurt poorer New Zealanders in the medium term. In June 1984 Muldoon announced a snap election to be held in July. This caused an immediate run on the dollar, as currency speculators believed a Labour win would mean devaluation. 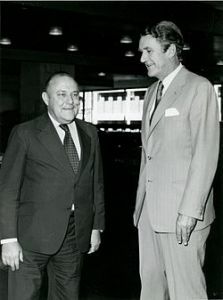 Despite a deepening foreign exchange crisis, Muldoon continued to refuse to devalue, forcing the Reserve Bank to take some extraordinary steps, such as closing the Forex markets for a short period of time to slow down devaluation. Government devalues New Zealand dollar by 20 percent. Finance Minister Roger Douglas begins deregulating the economy. 4 March: New Zealand dollar floated. Waitangi Tribunal given power to hear grievances arising since 1840. Royal Commission reports in favour of an MMP (Mixed Member Proportional) electoral system. Jim Bolger becomes National Party leader. Goods and Services Tax introduced. 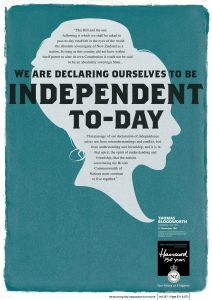 The Constitution Act ends the right of the British Parliament to pass laws for New Zealand. 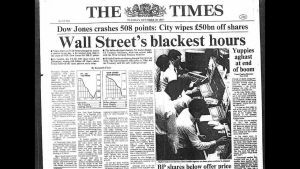 Stock Market Crash: Share prices plummet by 59 percent in four months. New regional councils take responsibility for water and soil management. Farmers diversify into deer and goat farming. Horticulture becomes popular in better soils. 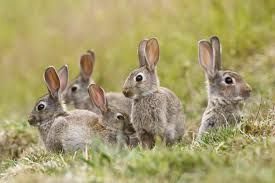 Sustainable use of South Island high country explored – programmes put into place to control rabbits. 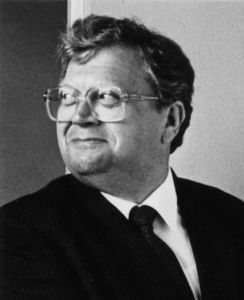 Prime Minister David Lange suggests formal withdrawal from ANZUS. Jim Anderton founds NewLabour Party. Lange resigns and Geoffrey Palmer becomes Prime Minister. First annual balance of payments surplus since 1973. Reserve Bank Act sets bank's role as one of maintaining price stability. First elections under revised local government structure. Geoffrey Palmer resigns as Prime Minister and is succeeded by Mike Moore. 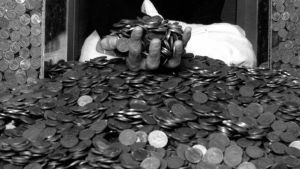 One and two cent coins are no longer legal tender. Commonwealth Games held in Auckland. 27 October: New Zealand general election, 1990: National Party has landslide victory. 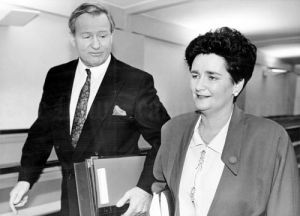 Jim Bolger becomes Prime Minister. The Resource Management Act 1991 is enacted, rewriting planning law. The Resource Management Act (RMA) focuses on using resources to provide wellbeing for people while safeguarding the environment. 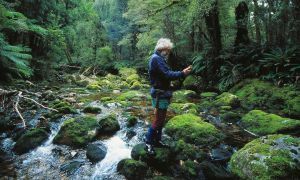 Landowners take responsibility for impacts of their activities. Tougher environmental standards set in place. 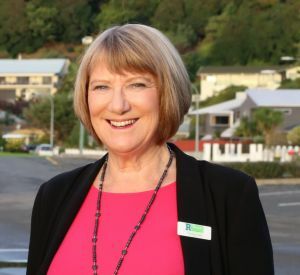 First budget of new Finance Minister, Ruth Richardson. Welfare payments further reduced. The Alliance party is formed. Consumers Price Index has lowest quarterly increase for 25 years. Crown research institutes are formed for agricultural research, ending research through government departments. 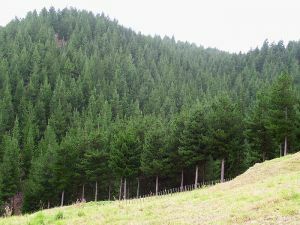 Forestry planting expands. 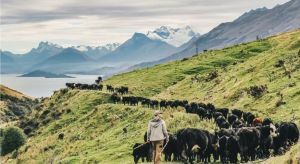 Conversion of sheep and beef farms to dairy farms increasing, particularly in the South Island. Nutrient budgeting is encouraged. Christine Donald (now Christine Craig) joins the practice. 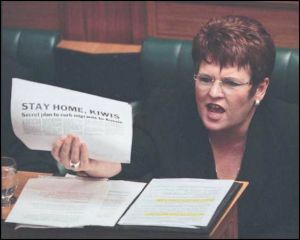 After leadership challenge, Bolger resigns and Jenny Shipley becomes New Zealand's first woman prime minister. The dairy industry is deregulated and two dairy companies merge to form Fonterra. 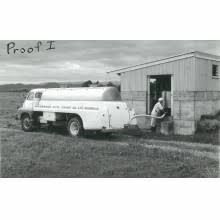 The first cow is milked with an Automatic Milking System. 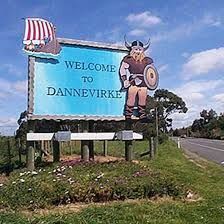 Average farm size - 105ha and 286 cows. 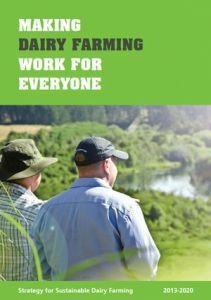 Dairying and Clean Stream Accord highlights water pollution of lakes, rivers and streams due to intensification of dairy farming and promotes sustainable dairy farming. 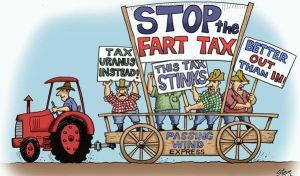 Tax on agricultural gas emissions (‘fart’ tax) proposed. Pollution in Rotorua lakes investigated. Amalgamation of smaller farms continues. Number of farms reduced from 71,505 in 1980 to 60,000. Wine, olives and avocados become popular diversifications. Invasive rock snot (didymo) found in rivers. Nitrate becomes an increasing problem in groundwater. 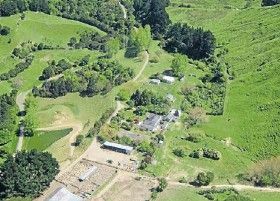 Christine & Murray purchased another 1250 acre farm at Kumeroa east of Woodville. Grant Ingram retired and Christine ran the practice alone – at this stage the practice was called Donald & Associates. 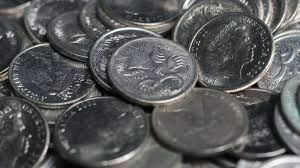 Five cent coins are dropped from circulation and existing 10 cent, 20 cent and 50 cent coins are replaced with smaller coins. The government announces a NZ$11.5 billion surplus, the largest in the country's history and second only to Denmark in the Western World. Murray Donald was tragically killed in a tractor accident on the farm at Motea. 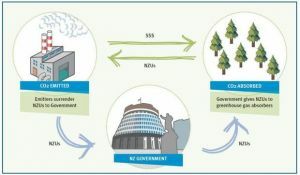 Climate Change Response Amendment Act passed to reduce emission of greenhouse gasescaused by human activity. An Emissions Trading Scheme (ETS) charges high gas producers as an incentive to produce less. 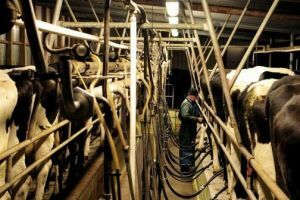 Report criticises dairy industry and high emissions production. John Key leads the centre-right National Party to victory in a general election, ending nine years of Labour-led government. New Zealand's economy goes into recession for the first time since 1998. 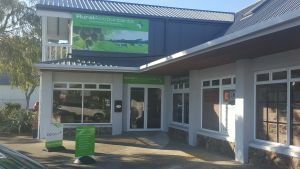 The practice opened another branch at Waipukurau and operated solely from Waipukurau from 2014. 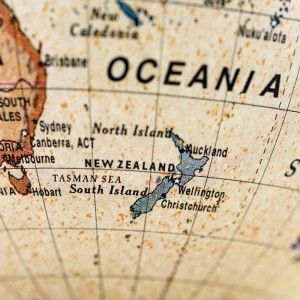 New Zealand's economy shrinks for the fifth consecutive quarter, making it officially the longest recession in the country's history. New Zealand's unemployment rate hits a nine-year high of 6.5% in the third quarter as the economy sheds 17,000 jobs. Reserve Bank Governor Alan Bollard warns of a slow and vulnerable recovery. Cow population 4.4 million. Average dairy herd size is about 400 cows. Sheep population reduced to just over 31 million. 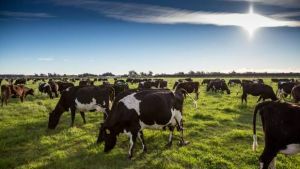 A new dairy industry strategy is launched that focuses on competitive and responsible dairy farming. 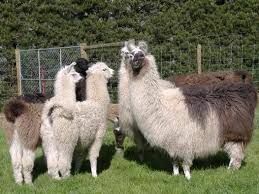 Average herd size – 402. 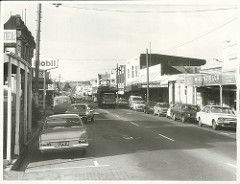 Christine married Ian Craig who was a kiwifruit orchardist and co-founder of OPAC in Opotiki. The name of the practice changed from Donald & Associates to Rural Accountants Limited. 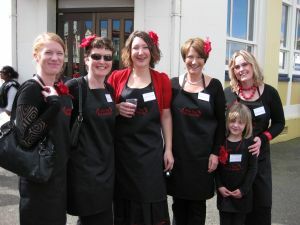 Shannon Harnett (Christine’s daughter) joined the practice and opened a branch in Whakatane. Inconclusive parliamentary elections. Labour's Jacinda Ardern forms coalition government. Frans Els joined the practice based in the Waipukurau office. 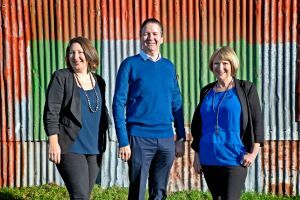 Christine, Frans and Shannon formed a three way partnership called Rural Accountants Limited Partnership. Rural Accountants purchased Brian Ritchie’s accounting practice (Brian Ritchie Accounting Services) in Whakatane. The practice purchased the Whakatane accounting practice of John Banbury called Prideaux & Co.
New brand launched with a website and new marketing strategies to support the business’s growth plans. As a farmer, Christine understands our business and how farmers and growers operate. We use Rural Accountants to provide a full accounting service to an orcharding partnership which operates a number of orchards with a wide spread of varieties and management systems. Rural Accountants are always timely and accurate, and their annual financial accounts are extremely easy to understand and very grower-friendly. 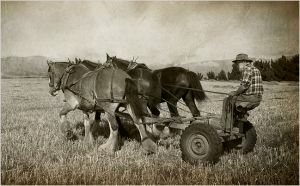 Rural Accountants is a real asset to our business. 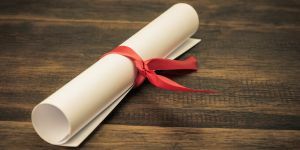 The team at Rural Accountants pretty much manage all our administrative tasks for the group including payroll and tax planning, ensuring we don’t pay any more than necessary. 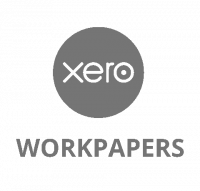 They are at the forefront of technology and have helped us get up and running with Xero and Figured which is much more efficient than the way we used to work. Christine is very knowledgeable, great to deal with and knows our business well. 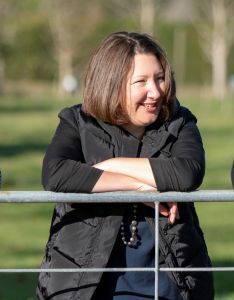 She is also a sheep & beef farmer so knows the industry really well and understands our needs. Rural Accountants keeps us on track through strategic and forward planning meetings throughout the year. Christine knows our business inside out so she can deal with our questions instantly.